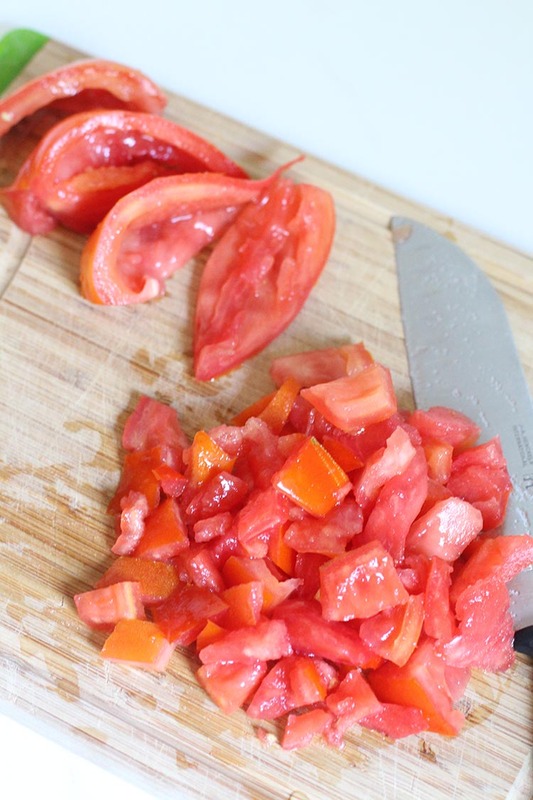 The printable recipes above explain exactly how I made each meal with fresh, chopped tomatoes. Overall, I spent $58 on groceries to make these meals. I already had all of the spices on hand and I bought a lot of organic ingredients. 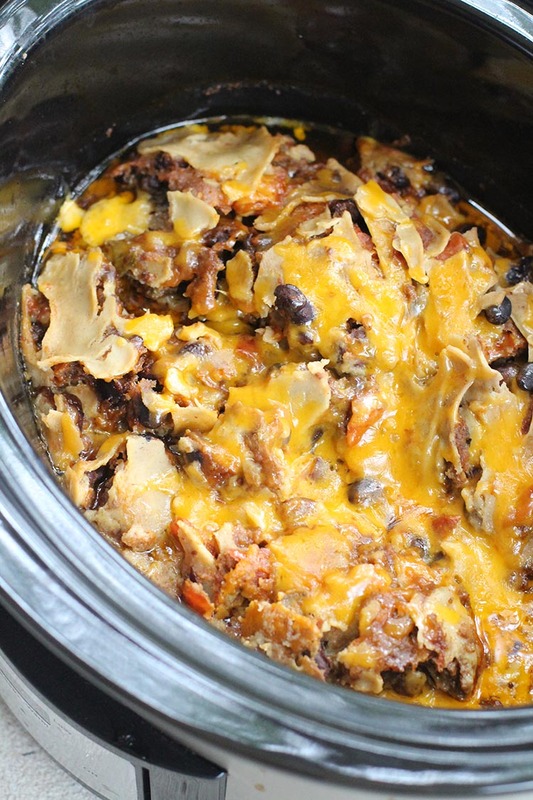 I’ve made all of these crockpot freezer meals before and I can tell you that they’re DELICIOUS. This was my first time making the Beef Enchilada Stack, and I wasn’t sure how it would turn out, but we ate it yesterday and loved it. It only took me 75 minutes to prep all five meals and clean-up my kitchen. I’ve seen pins on Pinterest that say you can make 40 meals in 4 hours, but there’s no way those are healthy meals. Peeling and chopping veggies takes time and I’m happy to spend that time prepping healthy meals for my family. 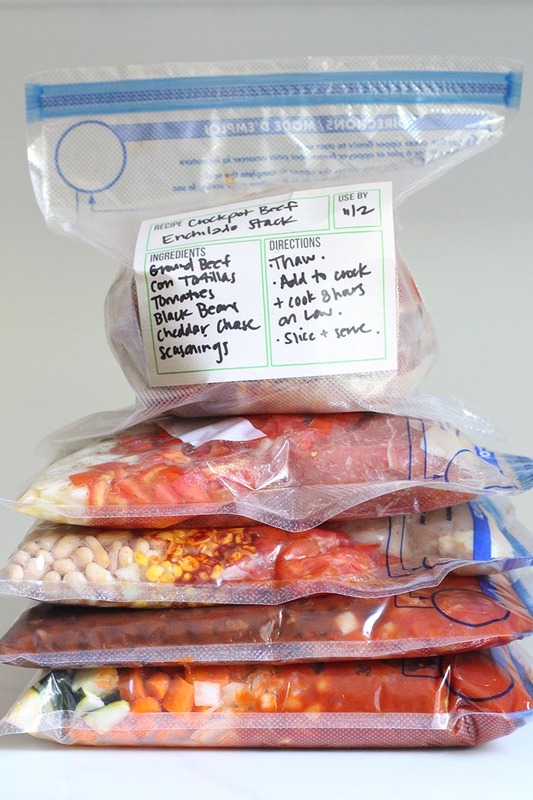 I added the freezer crockpot meals that I made to my back-to-school stash. Perfect for the busy weeknights to come. I do all of my grocery shopping ahead of time. I was pressed for time this weekend so I ordered my groceries online so I didn’t have to spend any time in the store. Yay! I fill out my freezer labels ahead of time so I can take my time and write neatly. 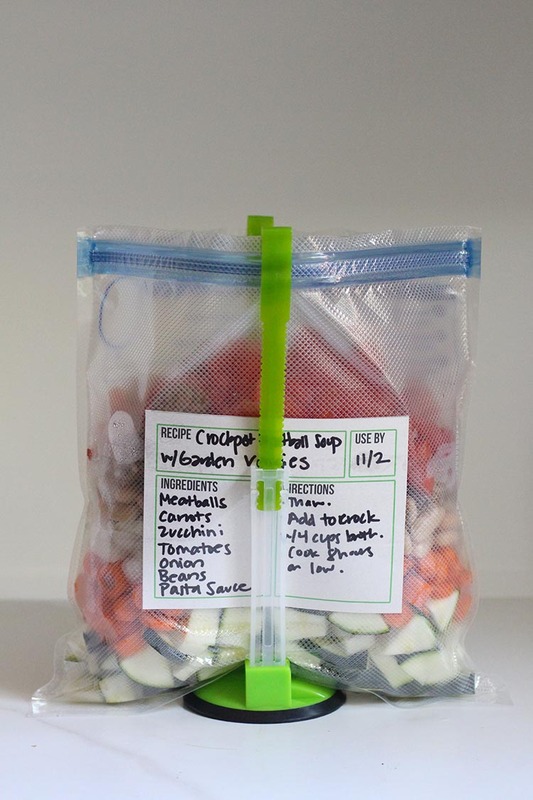 (This also saves time when prepping the meals because I’m more familiar with the recipes.) I use these printable labels that I send for free to my email subscribers. I print my recipes so I don’t have to search for them on my phone or iPad. 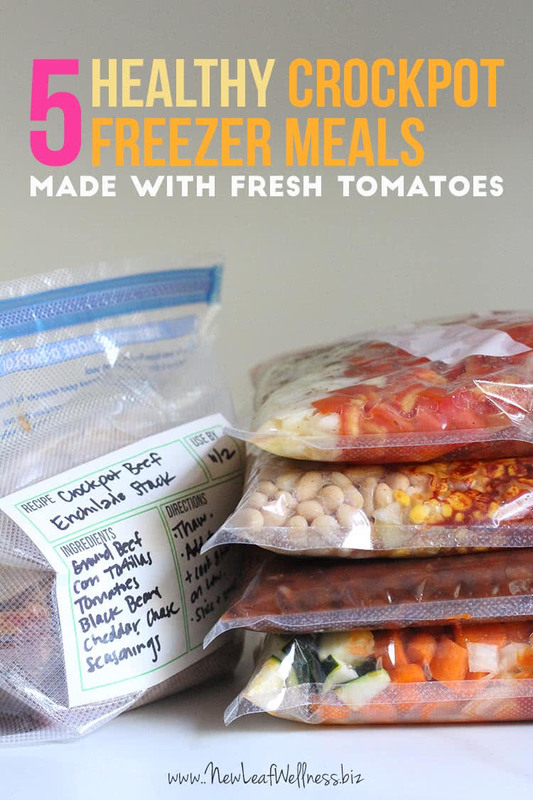 I dive right into prepping the fresh vegetables and add them to their freezer bags. This step takes the most time, but it’s worth it! Then, I focus on one bag at a time and add its sauces, spices, and meat. I’ve made HUNDREDS of meals this way and I’ll never go back to spending an hour in the kitchen every night. 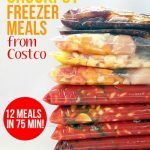 In my opinion, crockpot freezer meals are the easiest way to save time and money while feeding my family HEALTHY and DELICIOUS food. If you’re looking for more freezer cooking recipes and tips, check out my best-selling freezer eCookbooks. Thoughts or questions? Please leave a comment below and I’ll respond as soon as I can. I love taking advantage of fresh, in-season produce when adding to my freezer stock. Thanks for sharing another great freezer session! #4 says “Italian-Style Pot Roast (from my Slow Cooker Freezer Meals eCookbook and shared for free below)” and I don’t see the recipe or an eCookbook can you point me in the right direction pleas? 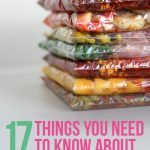 You can click the link for the eCookbook or click the printable recipe pdf for recipes in this post (It’s written in all caps with green lettering and says “FREE PRINTABLE RECIPES AND GROCERY LIST”). If you’re still having an issue, I would try a different web browser (for example Safari or Google Chrome) or a laptop (If you’re on your phone). These look AWESOME!! My wife is a teacher so she is in full out get meals ready and frozen for the first week mode. These will make a grea addition to some of the meals that we freeze to put in the oven. I subscribed to your emails. How do I get the labels to print? You should receive them via email after your confirm your subscription. If that didn’t happen for some reason, please email me at kelly@newleafwellness.biz and I will respond with new copies for you. Thank you for joining, Rita! Do you have a section veggie? Love my cookbooks!! I have tried several of the recipes and all are delicious. Also, using the crock pot helps to keep the house cooler during those hot summer days.